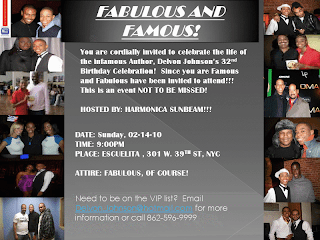 This Valentine's day, join all the famous and fabulous people who will grace Escuelita's for Love Yourself First author Delvon Johnson's 32nd Birthday Bash! Hosted by the incomparable Harmonica Sunbeam and featuring the Bleu Magazine Hotboyz, this is a party you won't soon forget. Escuelita's is located at 301 W. 39th Street between 8th and 9th Aves. in Midtown Manhattan. Beautiful people should plan to arrive beginning at 9 PM, take A,C,or E trains to 42 St/PABT. You can RSVP via Facebook here! Dress with class and style. Admission to Escuelita's is $10, but you can get in free by signing up for daily text messages from the club. See you there! Nathan Reads "Thickness" LIVE at Double Pride Panic! This is video of my live reading of my novella Thickness, from the Zane/Lee Hayes anthology Flesh To Flesh. Lee is developing this anthology into Flesh To Flesh: The Series. Enjoy this little glimpse into the "unapologetically raw" look at the lives and loves of gay men of color! Last spring, I joined several friends in participating as extras for the making of director Roger Omeus' movie, Finding Me: Truth. This is the sequel to Finding Me, the 2008 coming-of-age picture that introduces characters Faybien Allen, his friends and lover. In Finding Me: Truth, the story picks up once again, with the return of Faybien, Greg, Amera, and a few new faces as well. The continuing story is a welcome follow-on to the original movie, and it was a moving experience to see director (also writer and producer) Omeus and the cast working so hard to create a movie for and about our community. The Truth cast includes such fine actors as Ray Martell-Moore, Eric Joppy, Maurice Murrell, and Bry'Nt, and my day with them at Pier 59 Studios was a fascinating experience. Joining me in supporting the film as extras were DJ Baker of Da Doo-Dirty Show, NYC Socialites promoter Eric Parker, Maurice Runea Show host Maurice Runea, and model Corey Holder. Below, check out the movie trailer for the upcoming release of Finding Me: Truth this summer! See you on the silver screen! 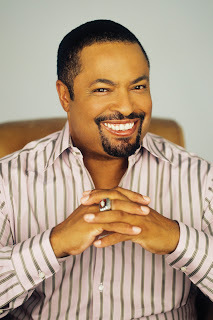 Gay-literature pioneer and acclaimed author E. Lynn Harris passed away last summer at age 54 of undiagnosed heart disease. Harris, who wrote groundbreaking novels which opened up the modern gay-literature genre, is widely considered to be an American literary icon. His sudden death shocked us all, as a genuine human treasure was removed from within our midst. Everette Lynn Harris was my own great literary influence, who encouraged me and befriended me, and made it possible for me to write and get published, when I had my own doubts about being able to do so. He often recalled his own difficulties in getting his very first book, Invisible Life, published in a time when American publishers shunned "gay-lit". He originally self-published that first book as a result, selling copies out of his car trunk, until someone noticed its stellar quality and persuaded publishers to take another look. So began Harris' literary career, which spanned fifteen novels, eleven of which made the New York Times bestseller list. 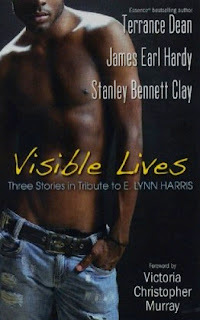 Now, in tribute to his life and career, three noted black gay authors, James Earl Hardy, Stanley Bennett Clay, and Terrance Dean have composed Visible Lives, three stories in homage to the gay-lit giant. It is fitting and proper that E. Lynn Harris be paid respect with a book written by his contemporaries, and all of us who write gay literature today are certainly indebted to Harris for opening the doors for us. Each of Visible Lives' three authors is accomplished in their own right as a wordsmith of the gay genre. James Earl Hardy is the author of the unforgettable B-Boy Blues series, Stanley Bennet Clay has given us In Search Of Pretty Young Black Men and Looker, and Terrance Dean penned the tell-all of gay life in L.A.'s music industry, Hiding In Hip Hop. These distinguished authors have created a fine salute to E. Lynn Harris, and I highly recommend you pick up a copy when it releases in May. You can pre-order one here.